You’ve likely heard the words “Milk does a Body Good”. This recommendation is not based on sound science and may even lead to decreased health and increased disease. Humans are mammals and like all mammals we produce milk to feed our young. The milk produced by each mammalian species is specifically designed by nature for the needs of their individual babies. This milk is only necessary for a short time and then that baby moves on to solid foods with different nutrition. All mammals are eventually weaned when their body no longer needs what their mother’s milk provides, but humans are driven by profit and have found a way to never be weaned. Baby cows drink their mother’s milk. Should humans? Humans are the only mammals that drink the milk of other species of mammals. Before you get upset and defensive, hear me out. In the context of human existence, this is a fairly new occurrence. Dairy consumption began with the advent of agriculture and the domestication of animals roughly about 7,500 years ago in central Europe. Dairy became a dominant food source in the United States in the 1960’s with the introduction of fast food. If She’s Not Your Mom, It’s Not Your Milk! As American families began eating out more because of their increasingly busy lifestyles, more and more dairy products were introduced into their diets. The most common dairy products are milk, cheese, butter, yogurt, sour cream, ice cream and whey protein, although there are others. 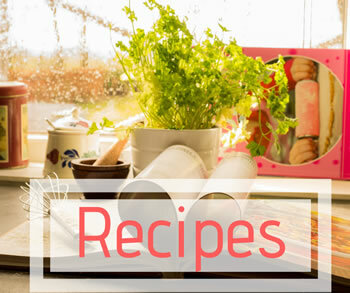 The Food and Drug Administration recommends 2-3 servings of dairy products per day. This recommendation is based on caloric intake. 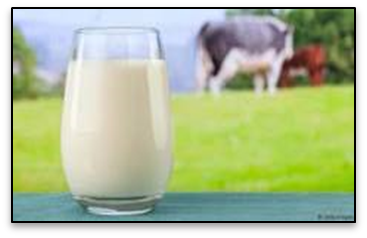 Just one 8-ounce glass of whole milk contains 148 calories. 2,000 calories are the total recommended amount of calories to be consumed daily. If you drink three glasses of milk, you are already at 444 calories. What about the rest of the items on the food pyramid? The worst part about the Food and Drug Administration’s recommendations are how vague they are. The recommendations could be interpreted in very different ways. For example, “as long as I stay within the caloric recommendations, I can eat meat, carbohydrates and dairy only, every day, and I will be okay”. Obviously, that’s not the case. Unfortunately, in today’s world, things need to be spelled out more specifically… (this is why there are warning labels saying “do not eat” on things like dish soap and hemorrhoid cream). Even the best nutritionists and dietitians cannot accurately track their daily caloric intake and let’s be honest, in today’s busy world, who has time for that? Besides, not all calories are the same. Caloric intake should be based on quality, not quantity. Eating the same number of calories in the form of a cheeseburger, fries and large soda is not the same as eating an equal amount of calories in the form of fruits, vegetables, nuts, seeds and wild or grass fed meats. Processed foods are full of empty calories which leave you feeling hungry and eventually leads to obesity, among many other health problems. It’s a pretty safe bet that you could consume as many unprocessed foods as you want without having to worry about those same problems. Dairy products are very processed. It is also important to note that the FDA, the USDA and lobbyists are far more concerned with the profits and political interests of the industry than the health problems that ensue. Those health problems are considered collateral damage and a separate profit opportunity in the form of pharmaceuticals that merely deal with symptoms and not the root cause of health problems. In the United States, cow milk is consumed most commonly, but goat milk is used as well. Cow milk is very high in a sugar called lactose which requires an enzyme called lactase to break it down to a usable form. 75% of humans, or three quarters of the world’s population are lactose intolerant, which means they are genetically incapable of properly digesting lactose since their bodies do not produce the enzyme required to break it down. Because of this, lactose causes irritations like upset stomach, gas and bloating as well as inflammation and diarrhea. That alone would suggest that humans should not consume dairy products. Cows are also pumped full of antibiotics to keep them alive and healthy enough to survive filthy factory farm conditions. The antibiotics are passed on to humans who drink the milk. This creates antibiotic resistant bacteria. Milk is also full of saturated fat, which may not be a problem by itself, but this combined with the milk sugar, hormones, antibiotics and lack of beneficial bacteria through pasteurization can cause ill health and obesity. The reason for the slowed metabolism is that cells are designed to store away fat to be used later as energy. In the United States, most people live a sedentary lifestyle and eat too much sugar, so those fat reserves never get burned. Their body is used to burning sugar and can’t burn the fat. Instead, they just build up until you must buy new clothe. Dairy products also aggravate irritable bowel syndrome, colitis and Crohn’s disease by causing the mucosal response of the membranes in the intestines to over react, which causes inflammation. Inflammation is the common denominator in all auto-immune diseases. Processed cheeses are the worst. Cheese is also full of sodium chloride, not the natural forms of salt like sea salt that have all the complimentary minerals without the chloride. 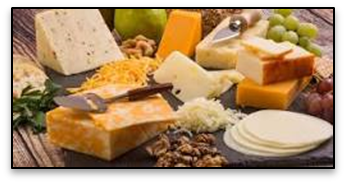 Cheese can contain up to 800 mg of processed sodium per ounce. Varieties including blue-cheese and feta, as well as processed cheeses such as Velveeta, are so loaded with sodium that they’re actually saltier than seawater. Both of these things can contribute greatly to heart disease. 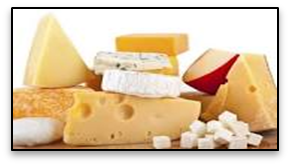 Cheese also contains casein and casein fragments called casomorphins. Casomorphins are a casein-derived morphine-like compound. Basically, dairy protein has opiate molecules built into it. When cheese is consumed, these fragments attach to the same brain receptors that heroin and other narcotics attach to, resulting in addiction. There is no objective evidence that milk is as good for humans as we are led to believe. The so-called proof that dairy is good for humans is manufactured by lobbyists who have something to gain by the increased sales of dairy products. In fact, many ailments such as allergies, asthma, acne, migraines, upper respiratory infections and chronic constipation have been linked to regular dairy consumption. Serious conditions such as heart disease, breast cancer, ovarian cancer, lung cancer, type 2 diabetes, endometriosis, erectile dysfunction, rheumatoid arthritis, Alzheimer disease and osteoporosis have also been linked to regular dairy consumption. 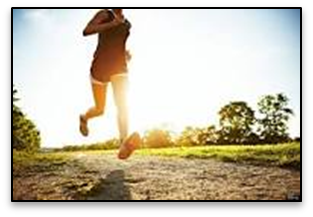 See my article on insulin resistance. For men, prostate cancer risk may increase by as much as 30%-50%. Many doctors and physicians, such as Dr. Mark Hyman M.D., Dr. Walter Willet, Dr. Michael Klapper M.D. and Neal Barnard P.A., have come out against the mass consumption of dairy products due to health and weight problems that are caused or exacerbated by these products. The FDA’s recommendations are not based on sound science. In fact, drinking milk and consuming dairy products has not been scientifically proven to increase calcium absorption or to prevent bone loss or bone fractures. Calcium supplementation has not even shown to support bone health. According to an analysis published in the British Medical Journal, most studies failed to show any link between the consumption of dairy and reduced occurrences of broken bones or fractures. Everyone needs calcium but excess calcium from milk and dairy may increase cancer risks, and will cause hypercalcemia, which will weaken your bones, cause kidney stones and even interfere with how your brain and heart function. Dairy may increase the likelihood of bone fractures by up to 50%. In countries where people consume little to no dairy at all, such as Africa and Asia, people have a much lower rate of osteoporosis. Contrary to what we have been told for the last 50 years, dairy is not required for our health. Dairy does not improve the performance of athletes either, regardless of what the carefully crafted “Got Milk?” advertisements may say. Children, who replaced soda with milk in school, did not lose weight but gained weight. It doesn’t help that the milk drank by children in schools is most often chocolate milk, whereby adding to the child obesity crisis in the United States. Something to take into consideration is the type of digestive tract humans have. Unlike carnivores, our digestive tract is very long. This means that the less fiber we eat, the longer food stays in our system. Things like constipation and inflammation cause food to get “stuck”. This leads to putrification and infection. The protein, calcium and vitamin D that is found in dairy products can and should be obtained from other sources that are much more easily broken down and absorbed by the human body. These sources of calcium include, but are not limited to dark leafy greens, broccoli, kale, bok choy, turnip greens and mustard greens. Protein can be acquired from nuts, seeds, and wild and grass fed meats. Our bodies make vitamin D3 from short wave ultraviolet rays (UVB) from the sun. This vitamin is much more important to bone health than calcium. It is also important to know that dairy products do not naturally contain vitamin D. Milk is enriched with it during processing. Adult bone density and bone mineral content are strongly influenced by exercise, especially during childhood and adolescence. This is a great reason for kids to go outside and get some exercise! (as well as a whole other topic). Environmental impacts are just another reason to avoid dairy at all costs. All things considered, producing one gallon of milk requires 683 gallons of water. As we all know, the worldwide fresh water shortage is becoming a bit of a crisis with our ever-changing climate. Water is required to grow the animal feed crops as well as to water the cow. Water requirements are significantly higher for lactating and pregnant cows than they are for cows who are not pregnant or lactating. The feed required for dairy cows causes many forms of environmental damage in itself. This damage includes soil nutrient depletion, overuse of synthetic nitrogen fertilizers and runoff which causes the salinization of water and soil, as well as algal blooms and dead zones in coastal waters. The feed grown for cows is also genetically modified, which cross-pollinates with non-GMO plants. This has the potential to create toxic hybrids and is having an adverse effect on our pollinators. For every two gallons of cow milk produced, eight gallons of cow manure are produced, adding to the soil and water pollution problem. As you can see, all of this is bad for humans and our environment. In conclusion, avoiding dairy at all costs will not only save you money, as food prices continue to skyrocket, but it will also save you from suffering health issues and help to keep you from gaining an unhealthy amount of weight. Eating healthy is all about consuming what your body was designed to eat. 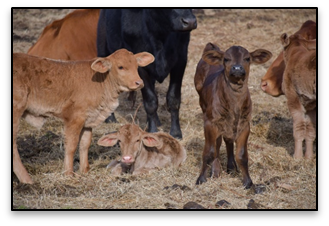 Cow’s milk is not suited to the nutritional needs of humans, but instead, to the nutritional needs of calves which gain up to a thousand pounds before they are even one year old. It should not be surprising that consuming it and its derivatives causes us so many problems. Human beings, like all life on Earth, have an intrinsic relationship with the natural world. We should have more respect for ourselves, our environment and the other life we share this planet with. It would be better for people, animals and the planet as a whole if we would put overall health above profits. Once you have broken free from the addiction to toxic eating, it is easier to listen to your body. Your body will begin to function properly again, and it will tell you what it needs and when it needs it.